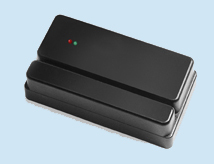 IBC's newest Common Access Card reader for connecting to controllers. Reads all 1-D barcodes from all versions of CAC cards, and TWIC cards. The Smart Cac is a barcode reader built specifically for the reading of barcodes on USID, CAC, and TWIC cards. User programmability allows the selection of which ID number fields to output, and the output format. Output from the reader can be wiegand, aba, wand emulation, or f2f. The Smart Cac is firmware upgradeable in the field.